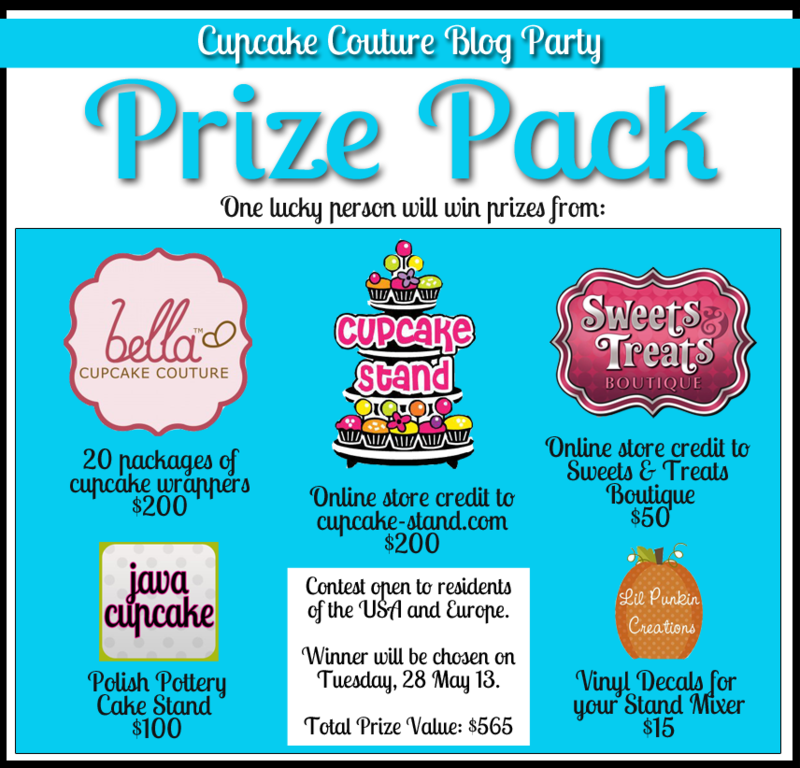 Your Cupcakes Take the Cake Correspondents Betsy Eves & Ashley Khawsy, along with 18 other bloggers have joined together with Carrie Middlemiss of Bella Cupcake Couture to bring you the Cupcake Couture Blog Party! 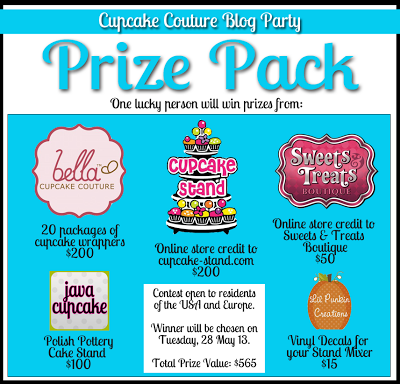 This sweet party features 21 blogs, 20 cupcake recipes, 20 party displays and a Prize Pack worth $565! Make sure to visit all the blogs and check out the cupcakes and displays! Thanks to our amazing Prize Pack sponsors for their generous donations! Please, visit their websites to see more of their fabulous products! To enter to WIN this Prize Pack, simply fill out the entry form below. Contest opens 21May13 at 0700 PST and closes 27May13 at 2359 PST. One winner will be chosen and announced within 24 hours of the contest ending. Winner will be contacted via email to claim their prize. This contest is open to residents of the USA and Europe only. I'm a sucker for ANYTHING zebra print! Pink zebra print cupcake wrappers are ADORABLE! My favorite cupcake wrapper is the birthday party hats design. I also love all the polka dot designs. I really like the Meisha - bird with cherry blossoms wrappers. I like the Polkadots cupcake wrappers. I also think the zebra print ones are nice too.. Favorite Bella Cupcake Couture right now is the shiny silver polka dots. The red and white stripes was also a favorite when it was in stock. Thanks for the blog party! My favorite cupcake wrapper is the Cheetah! the Olivia Swirl in Lavendar is my favorite! rownies are one of my faves. I use the version that’s in Laurie Colwin’s book “More Home Cooking”. I can’t get unsweetened chocolate here in Malaysia but we have good cocoa & I simply swap it weight for weight. Turns out beautiful brownies, not too fudge & not too cake like. I nicknamed my grand daughter cupcake this would be so cool to win. Just in time for her 1 st birthday! The LuLu Damask in black and white are my favorite wrappers at Bella! We're having so much in this Cupcake Couture Blog Party! Thanks everyone for joining the festivities. The cupcake recipes and cupcake wrapper displays are phenomenal! 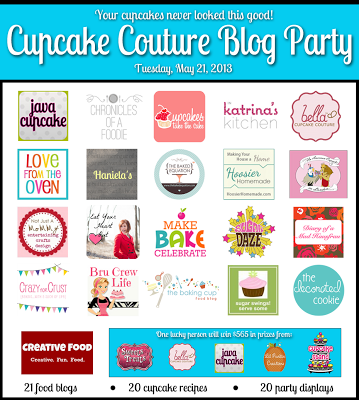 Thank you for participating in the Cupcake Couture Blog Party! We're having so much fun. The cupcake recipes are delicious and the cupcake wrapper displays are stunning. So creative! I love any damask cupcake liner. They can go with any cupcake and any event!